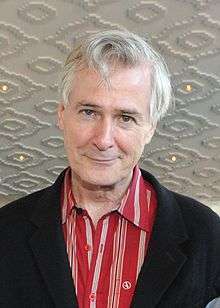 John Patrick Shanley (born October 13, 1950) is an American playwright, screenwriter, and theatre and film director. His play Doubt: A Parable won the Pulitzer Prize for Drama as well as the 2005 Tony Award for Best Play. He won the 1988 Academy Award for Best Original Screenplay for his film Moonstruck. Shanley was born into an Irish-American family in The Bronx, New York City. His mother worked as a telephone operator, and his father was a meat-packer. The neighborhood Shanley grew up in was considered very rough. His academic career did not begin well, but ultimately he graduated from New York University with honors. In his program bio for the Broadway production of Doubt: A Parable, he mentions that he was "thrown out of St. Helena’s kindergarten, banned from St. Anthony’s hot lunch program and expelled from Cardinal Spellman High School." He was heavily influenced by one of his first teachers, Sister Margaret McEntee, who he based the character of Sister James on in his play, Doubt. After his Freshman year at New York University, he was put on academic probation. He then enlisted in the United States Marines, serving in a stateside post during the Vietnam War. Following his military service, he wrote a novel, then burned it, and returned to the university with the help of the G.I. Bill, and by supporting himself with a series of jobs: elevator operator, house painter, furniture mover, locksmith, bartender. He graduated from New York University as valedictorian in 1977. He has also written for film; his second film, Moonstruck (1987), stars Nicolas Cage and Cher, and won three Academy Awards, including one for his screenplay. In 1990, Shanley directed his script of Joe Versus the Volcano. Shanley also wrote two songs for the movie: "Marooned Without You" and "The Cowboy Song." He wrote the screenplay for the film Congo (1995), which was based on the Michael Crichton book. His play Doubt: A Parable ran on Broadway from March 31, 2005 to July 2, 2006 and won four 2005 Tony Awards (including Best Play), the Drama Desk Award (including Outstanding Play) and the Pulitzer Prize for Drama. Shanley directed the 2008 film version, which starred Meryl Streep, Philip Seymour Hoffman, Amy Adams and Viola Davis. The screenplay was nominated for an Academy Award, and the film won the Writers Guild of America Award for Best Screenplay Written Directly for the Screen.Doubt: A Parable, is featured in The Fourth Wall, a book of photographs by Amy Arbus for which Shanley also wrote the foreword. In 2012, Shanley wrote the libretto for an opera version of Doubt: A Parable, which premiered at the Minnesota Opera in January 2013, with music by Douglas J. Cuomo. Until then, his experience with opera was not extensive; he had attended a few performances and had listened to recordings. As he worked on the libretto, using many lines that come directly from the play, he describes that his enthusiasm for the form grew. Also in 2012, his play Storefront Church ran Off-Broadway in a production by the Atlantic Theater Company. The play concerns Bronx residents "whose lives become tangled in unexpected ways when a mortgage goes sour". Storefront Church was also put up by San Francisco Playhouse in San Francisco in December 2013 where it was very well received. His play, Outside Mullingar, opened on Broadway at the Samuel J. Friedman Theatre, produced by the Manhattan Theatre Club, on January 3, 2014 (in previews) and officially on January 23, 2014. The play is directed by Doug Hughes and stars Debra Messing and Brían F. O'Byrne. The play is set in the Irish countryside. His new play, Prodigal Son, which he is directing, is produced Off-Broadway by the Manhattan Theatre Club. It opened on February 9, 2016 and features Timothée Chalamet, Robert Sean Leonard, Annika Boras, Chris McGarry and David Potters. The play concerns a lonely teen from The Bronx who attends a private school in New Hampshire. He is a graduate of New York University's Steinhardt School of Culture, Education, and Human Development with a degree in Educational Theatre, and is a member of the Ensemble Studio Theatre. Shanley currently resides in New York. In 2002 Shanley was inducted into the Bronx Walk of Fame. ↑ Bourque-Sheil, Brendan. Interview with John Patrick Shanley. Comedycongloverate’s Blog. January 9, 2012. ↑ "Storefront Church SF Gate". A Re-'Doubt'-able Effort: A Cultural Conversation with John Patrick Shanley in "The Wall Street Journal"